Plants perennial; stoloniferous, stolons often 2 m or longer. Culms 70-100 cm, decumbent, erect portions generally about 35 cm, pubescent beneath the inflorescences; nodes glabrous or densely short pubescent. Sheaths glabrous; ligules 1-1.3 mm; blades 6-25 cm long, 3-6 mm wide, glabrous or hispid. 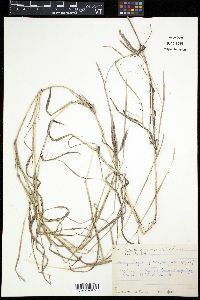 Rames (2)3-5(8), 4-7 cm, subdigitate, erect to divergent, bases pilose, without spikelets; internodes pilose. Sessile spikelets 4-5 mm; lower glumes more or less obovate, often involute, margins ciliate basally, keels winged distally, apices obtuse; awns 1.5-2.5 cm, twice-geniculate. Pedicellate spikelets 4-5 mm, usually staminate. 2n = 20. Dichanthium aristatum was introduced to the Americas from southern Asia. It is sometimes used as a lawn grass in Texas, Louisiana, and Florida.